Combine chestnuts, 300ml cream, milk, vanilla and sugar in a medium saucepan. Bring to the boil, stirring until sugar dissolves, over medium heat. Reduce heat and simmer (do not boil), stirring occasionally, for 30-35 minutes until chestnuts are very tender. Remove from heat and cool slightly. Using a hand blender, blend until smooth. Transfer to a bowl, cover and chill until cold. Whip remaining cream in a bowl until soft peaks form. Fold cream through chestnut mixture and serve. 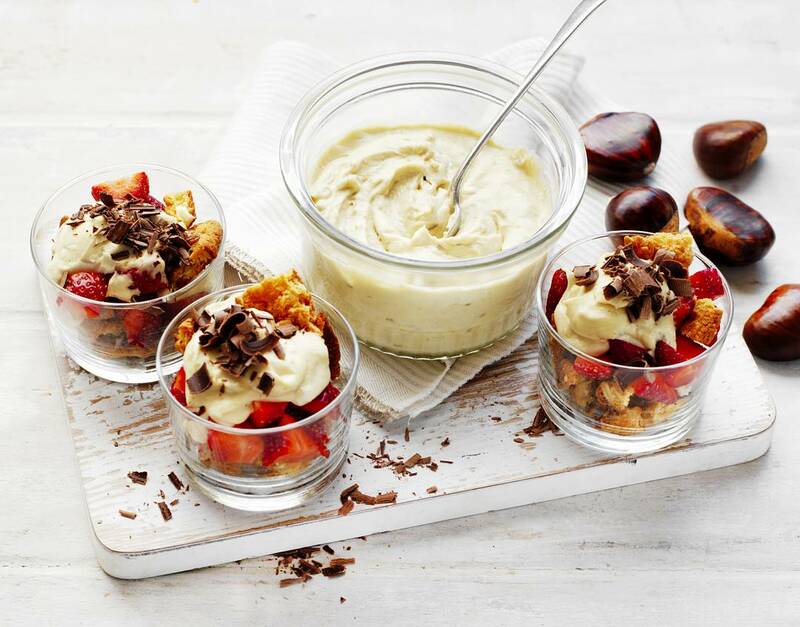 Layer with crumbled Anzac biscuits, diced strawberries and grated chocolate in serving glasses. Use in a filling for sponge cake or butterfly cakes. Spoon over poached pears or quinces. Serve with biscotti and fresh sliced pear. *Store chestnut cream in an airtight container in the fridge for up to 4 days.